Is absolute price level for a stock a key focus for you when investing? Do you constantly look for past price trends, 52-week lows, and highs when buying and selling stocks? Well, if you do, you are not alone. Such tendencies have deep roots in psychology. And this one could be attributed to 'anchoring bias' - becoming fixated on past prices and using only that information to make inappropriate investment decisions and ignoring the new developments. Mind you, there is nothing wrong with buying stocks on correction. But one needs to make sure that the 'correction' is not the only reason for buying. Value investing is not a play on absolute prices. One needs to be ready with the homework - understanding the business and risks, assessing management quality, and having an intrinsic value - before hoping to benefit from the stock price volatility. Most importantly, it requires pricing in the new developments and not getting driven by past story alone. Else what looks like a bargain could turn out to be a falling knife. Take the case of Cairn India. In March 2014, we recommended investors to Buy at a lower price, post around a 10% correction. The stock price went up post our recommendation...and then fell to correct to near recommended level. Had we recommended to buy the stock then, the loss till date would have been 33%. But we factored in new developments regarding management decisions that seemed against the minority stakeholders' interests and maintained an avoid view. Similarly, the decision to Sell should not be driven by absolute price levels, else you can lose your winners too early and miss the benefits of compounding. A case in point is Page Industries Ltd. The stock was recommended under Hidden Treasure in January 2009 at Rs 306 with an initial target price of Rs 630. With strong fundamentals and a growing business, the stock touched the target price in the first year of recommendation. Had we sold the stock then, we would have earned 106%. But the opportunity loss would have been huge. We continued to Hold, keeping in mind the growth prospects. The disciplined approach has been well rewarded. The stock has turned out to be a 48-bagger for our subscribers! If a stock seems to be in correction mode, there could be a good reason behind it. And what seems like a dip could be a potential crater. Similarly, a stock in an uptrend might still have significant upside. A 52-week high now could become a 52-week low a year from now. The key is to not lose focus on a stock's value when tracking its price. 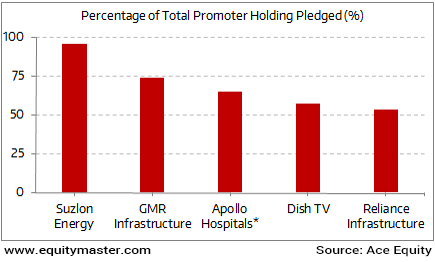 Promoters have been known to pledge their shares on more occasions than not. Is pledging of shares by promoters in itself a bad thing? We think the promoter looking to pledge some shares is fine but a combination of high promoter pledging, rising debt and shaky financials are definitely a cause for concern. The recent past has seen an increasing trend in the pledged shares by the promoter and one has to be extremely wary of such companies. From a universe of the BSE 200 list, these are the top 5 companies which have their promoter holdings pledged big time as per data available till June 2016. The promoter using pledged shares as a way of raising capital is okay. However, from a small retail shareholder's standpoint, a high amount of pledging with bad financials could lead to the banks or financial institutions (who hold these shares as a collateral) to dump them to recover their dues. This would then have a cascading effect on the stock price as well, resulting in a huge loss for the shareholder. Metal prices internationally have witnessed a rebound after trading at multi year lows for the whole of 2015. Both industrial and precious metals suffered huge decline in their prices impacting the mining companies adversely. What made the matters worse was overproduction which further exacerbated the industry's problems. Domestically, the aluminium industry faced difficulties in the form of cheap imports from China and other countries. However, the recent rebound in prices internationally provides some hope for the industry. The worst might just be over. With demand expected to pick up from China, which is one of the largest users of both industrial and precious metals in the near future, prices would likely strengthen further and stabilize. On the demand-supply front, data from the ministry of mines showed a supply deficit of almost 1 million tonnes. While the production remained flat for the year, it was the increase in demand that supported the rise in metal prices. This augurs well for the domestic producers. There is still a need though to exercise caution since industry data showed rise in aluminium imports by double digits for the period of April-June as compared to last year. Presently, with over 50 percent of the aluminium consumed in India coming through imports, the global situation and domestic measures to protect against a possible flooding of imports are key metrics that need to be monitored. After opening the day on a flat note, the Indian stock markets continued to trade near the dotted line. At the time of writing, the BSE-Sensex was trading up by about 13 points while the NSE Nifty was trading up by 2 points. Sectoral indices were trading on a mixed note with realty, IT witnessing the maximum selling pressure. While Auto stocks were trading in the green. This edition of The 5 Minute WrapUp is authored by Richa Agarwal (Research Analyst) and Rohan Pinto (Research Analyst). A Comeback for GSK Pharma? The stock price of GlaxoSmithKline Pharmaceuticals has witnessed sharp correction. Should one take the plunge? Equitymaster requests your view! Post a comment on "An Obsession That Could Erode Your Portfolio Performance". Click here! Equitymaster's Associate has financial interest in GSK Pharma.